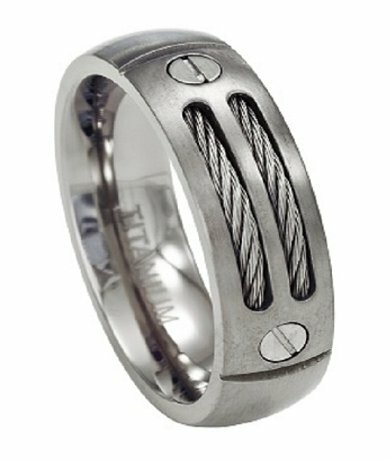 You don't have to be a rough and tumble kind of guy to enjoy this titanium ring. The double cable insert and stamped screw accents give this piece a unique industrial feel, while the high polish lend it a modern look. 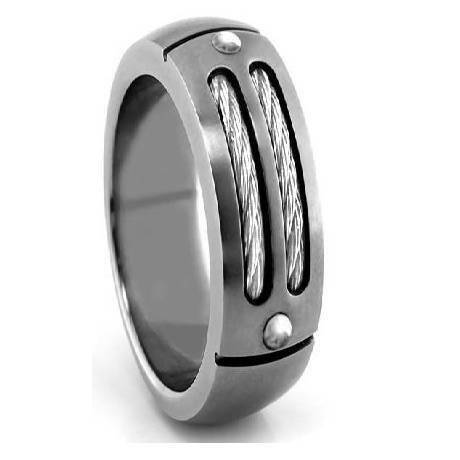 For something that's definitely unique but still clean, this is a sturdy choice (we mean that literally; this is a thick, substantial ring).Note: Comfort Rings are usually 1/2 size smaller. We recommend having your finger measured for a comfort fit ring at your local jewelry store first to ensure the correct fit. My fiancé struggled with picking a ring and we went to a store and found this.. The store couldn't get his size so I found the exact ring on line and love it! It was reasonable and came quickly! 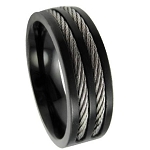 Loved the cable ring! Bought it for my husband for his wedding ring! We never had gotten him one. He didn't want to spend a fortune and was more for the meaning. He works in the oil field so it was very fitting and perfect for him. Great fit and not bulky! Glad we found it(on Pinterest) and it brought us to your website. Thanks!!!! My fiance and I wanted something different, something that represented us. These rings were perfect. The style, the fit, and the fact that I can wear it without breaking out makes this the perfect ring. I can't even wear gold without itching. Love my ring. Very happy with my purchase. I will buy from JMR again.Had several people ask me where I bought my ring from, JUST MENS RINGS you are the best. O by the way very fast shipping. P.S did I mention will buy from again. I got this ring for a birthday present for my boyfriend and he 100% loves it. It is very durable and still has its shine to it. I am so glad I decided to buy from this site and I will be back.